Hello everyone, so after many years (6 I think) I'm upgrading my pc. I have a budget to buy my new and I cannot change it in anyway. I don't use my pc for gaming, though I do play from time to time a few games, the last game I wanted to play was kingdom come deliverance and it wasnt playable, it is playable (55fps in medium/high) but there are framedrops that make this particular game unplayable for me. I do not overclock nor am I interested in doing so. I can go for either the Ryzen 5 2600 or the Intel 8400.
with an msi A320m Gaming Pro-la (or something similar) / Gigabyte Ga-h310m-h (or something similar) I don't use the onboard sound but an external dac so I don't care about sound. I was reading that ryzen really benefits with a dual channel ram and the speed of the memory too, so I was thinking of going for 2x8gb ram 3000mhz but if I buy the dual memories I wont be able to afford an SSD samsung evo 860 240gb for the OS. So, what's better, buying those extra 8gb (having 16b dual ram) or going for the samsung SSD? I cant afford buying both of them, it is either going for the 16gb or 8gb+ the SSD. Will the speed in the memories really make a difference? ryzen 2600 with those extra cores or go for the 8400? Lastly I don't plan changing my OS, I wont install win 10 for now, maybe when I'm really forced to do so but not at the moment. - Cant afford buying everything or something that is not listed. - It wont be a gaming pc. keep using my old sata 4tb hdd for the OS. Thanks and sorry for the convoluted post xD ! I’d highly suggest NOT using an A320 motherboard with the R5 2600, as you will run into some issues. why is that? and what chipset do you recommend me? R5 is short for Ryzen 5 2600. It’s a thing with how the CPU interacts with the system, and the A320 is outdated. Id recommend a B450 or an X470 chipset board. I can buy the Gigabyte Ga-b450m Ds3h or anything similar. Please provide Country and Budget. DEFINITELY find budget for an SSD. If you don't get an SSD, it's basically wasting the upgrade altogether. 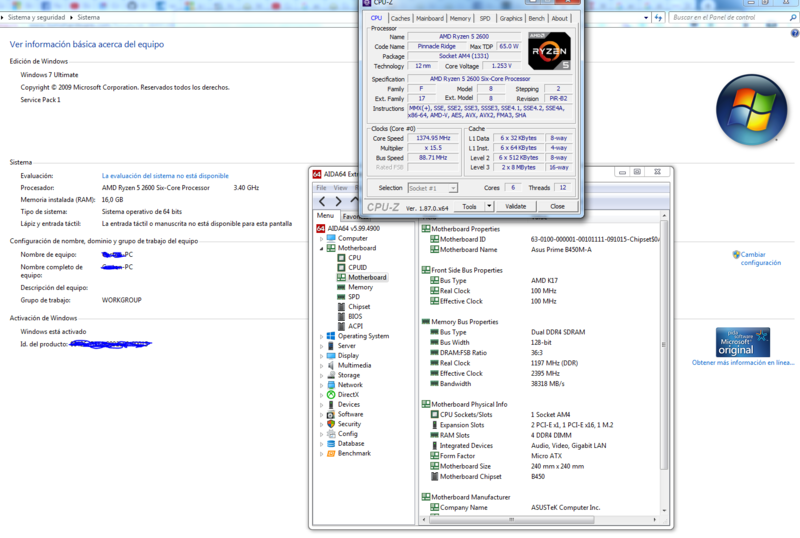 8GB of RAM is still fine for now. I'm from argentina, my budget would be around 650 dollars, bear in mind that the prices here are way higher than in other countries, for example a ryzen 5 2600 cost around 280 dollars and they can go as high as 300... motherboard b450 $120 (a cheap one), 8gb ram module $90 ("cheap" brand, like kingston 2400mhz) if I buy a dual kit (2x4gb) around $160-180, the SSD $160 more or less (always talking about 240-250gb and something reasonable decent like the evo 860), the i5 8400 $300 so it's a bit more expensive than the ryzen. every will end up costing around $560 (I spotted a place where they have the ram and SSD really cheap) also buying everything together in that place gets me a discount. Thank you and everyone else for replying and helping me out, I would have end buying 16gb ram with a a350 if it werent for you guys, so thanks again. ok, got my pc running, after around 6 hours of hair pulling is now working. - I tried to install windows 10 but but it wouldnt run with the usb stick, there was no way to make it run (I made it via rufus...) and burning a dvd was impossible at this stage since i didnt have a pc to burn it. the so called error error installing windows 0x80300024 which drove me crazy!!! I then installed win 7 original with no sp1, no mouse or keyboard were detected during the whole process so i used my ps2 keyboard. now im in the process of updating windows (using wufuc ) no issues so far. 2x8gb dual channel Adata Flame Ddr4 (AX4U240038G16-SBF) these were 2 separated sticks and are working just fine in dual channel.